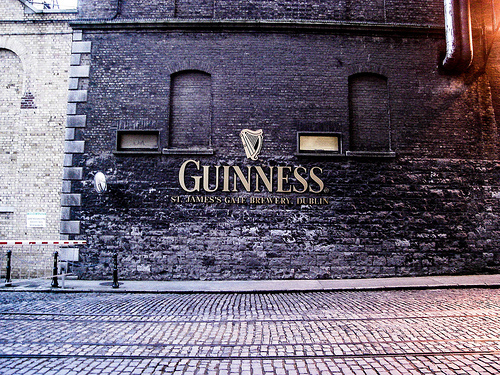 We previously listed The Guinness Storehouse as the most popular tourist attraction in Dublin. Well now we’re going to tell you a little bit more about it. Firstly it’s located right beside the NRC office in St James Gate, James Street, Dublin 8 so the team at NRC have all enjoyed the delights of the Guinness Storehouse! If the sun is shining, Guinness has a lovely podcast which walks you from Dublin city centre to the Guinness Storehouse. You will learn all about the famous and historic buildings along your journey and the history of the Guinness family so definitely worth a listen. There is a handy iwalk map to go with this and is available on the Guinness website. Of course if its raining just call NRC Taxis on 01 677 2222, as we are the nearest taxi firm to the Guinness Storehouse, and we will take you there in a jiffy! The average price of a taxi to/ from the city centre will cost around €10 for 4 people depending on traffic. The storehouse is open from 9.30 pm to 5pm seven days a week so you’ll have no excuse not to pop along to the Guinness Storehouse and sample the black stuff! Most importantly don’t forget to buy your tickets on line to get the 10% discount! Make sure to give yourself plenty of time when you visit the Guinness Store house because there are 7 floors, each with a unique story to tell about the history of Guinness and how its grown to such a successful global brand known throughout the world! You will learn how they make stout using 4 ingredients – water, barley, hops and yeast and you will get your first sample of the day at the Guinness taste experience – mmm! One of our favourite floors is where you learn to pour the perfect pint..and then drink it! At this stage you might be getting peckish so you can visit floor 5 where you can experience some wholesome and hearty traditional irish grub some cooked with wait for it..Guinness! And then you reach the place you’ve all been waiting for – The Gravity Bar where you have a 360 degree view of Dublin and enjoy a perfect pint of Guinness! This tour is not to be missed – you get to experience Irish history, culture, traditions and food and that’s before you have a pint of Guinness!